Hampstead United Methodist Church is proud of its support of our congregation and of the Hampstead community. HUMC provides a safe and secure environment for our children and youth through our Preschool, Scout troops, Vacation Bible School, and UMYF. Activities for adults include UMM, OWLS and UMW Circles. The Leap of Faith food pantry, MUNCH backpacks, Thanksgiving Dinner bags, and MHC Christmas Angel Tree gifts are just some of the HUMC missions providing support to our community families in need. More details on a number of these activities are available on this website. As HUMC expands its facilities and congregational and community programs, the costs to maintain and grow activities have and will continue to increase. Unfortunately, the increases in utility and maintenance costs we have all experienced affect the church as well. While we each have special missions that we want to support, please remember to contribute to the church’s General Fund, which supports the operation of our facilities and our staff, as well as activity and mission administrative costs. We greatly appreciate your generous financial support of our church and its programs. If you have questions on any of the information below or have other concerns regarding making a donation to HUMC, please contact the Financial Secretary at the church office at 910-270-4648, ext. 101. We are registered on AmazonSmile! If you shop at smile.amazon.com, 0.5% of the total price of your eligible purchases will be donated to HUMC. This is the same as shopping on Amazon.com--it just means that you will be able to help the church too! Our unique link is: https: // smile.amazon.com/ch/56-1244923 . Just click on the link above or enter the link into your browser, and you are choosing HUMC as your charitable organization. If you are unable to use the link, you can still register at smile.amazon.com, and choose Hampstead UMC from the list of eligible organizations. When logging into AmazonSmile using your existing Amazon account, make sure HUMC is listed as your charity of choice. If you previously selected another charity, Amazon will not automatically change to HUMC, even though you clicked "yes" to keeping HUMC as your charity selection on entering the site. If you have questions, please contact the Financial Secretary. We receive an offering at all three worship services each Sunday. Offering envelopes are available in the pew pockets. Please make your checks payable to: HUMC, and remember to write the fund(s) to which you are donating on the memo line of your check or on your envelope (checks without a designation will be applied to the General Fund). If you are unable to attend worship, you may mail checks to: 15395 HWY 17N, HAMPSTEAD, NC 28443. Automated checks can be drawn from your bank account using the “bill pay” option of your online bank account. Establish “HAMPSTEAD UMC” as a payee, using the mailing address: 15395 HWY 17N, HAMPSTEAD UMC 28443, and phone: 910-270-4648. Checks can be issued as a one-time or recurring donation. Be sure to use the memo line to indicate the fund(s) and amount(s) where your donation should be applied. Checks without a designation will be applied to the General Fund. Contact your bank for questions and any specific procedures they may have. If you prefer to have your checking or savings account debited for your recurring contribution to the General (Operating) and/or Building Fund, HUMC uses VANCO Payment Solutions. Your donation will transfer directly to the church’s bank account. 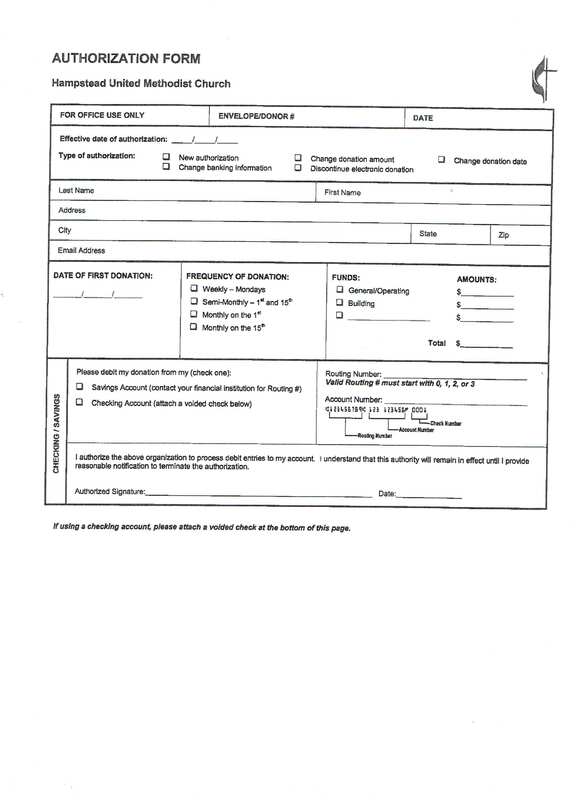 You may download an authorization form here (VANCO Form) or you may pick up a form in the church office. Return your completed form to the Financial Secretary in the church office. Many businesses will donate part of their profits to charities. Please know that HUMC is a non-profit organization listed on Guidestar. Check where you shop to see if they have a program to support charities. If you would like to explore the possibility of donating items to HUMC (such as stocks, mutual funds, etc. ), please contact the Financial Secretary to discuss available options.